Based on the true story of two young men, David Packouz (Teller) and Efraim Diveroli (Hill), who won a $300 million contract from the Pentagon to arm America’s allies in Afghanistan. “War Dogs” is a movie that has been on my horizon for sometime. I saw the trailer and liked it but didn't love it. Furthermore I like Teller and Hill but equally they are not in my top tier of actors in Hollywood. I really enjoyed Teller in "Whiplash" though, but I thought he was miscast for “Fantastic Four”, he's not a comic book actor, he is more suited I feel to serious roles. As for Hill, I have enjoyed him in many roles such as the Jump Street movies, “Moneyball” and “The Wolf of Wall Street” but I've never “really” loved him. However I decided to take the plunge and see “War Dogs”. I'm glad I did, I enjoyed it more than I thought I would based on the trailer and the lead actors. The movie is told from the standpoint of Teller’s character Packouz. He narrates the movie Wolf of Wall Street style, albeit with freeze frame narrations. I had heard that this story telling element became tiresome in this movie, but I was fine with it. The two lead actors have very good chemistry and work well off each other. Between the two I definitely preferred Teller’s character who plays the straight man trying to keep a young family together to Hill’s douchbag two faced loner. “War Dogs” is a biographical crime drama with comedic elements, the trailer slightly miss sells the movie making you think that it's a comedy. It's not. The humour though when used, worked well. It's a little slow to start in the first act, as the movie spends a while getting the pieces of the puzzle together. However, as the film wore on it became more and more engrossing as these two guys got themselves deeper and deeper into trouble. It was at the latter stages of the movie that I found myself enjoying it a lot more. Teller and Hill aside, the only other notable players were Bradley Cooper as Henry Girard a shady arms dealer (His role is very small), Sydney Pollack as an investor of Teller and Hill’s company and the devastatingly beautiful Ana de Armas as Iz, Teller’s wife. As the summer winds down and we get ready for the more “serious” season of Autumn and beyond, you could do a lot worse than “War Dogs”. 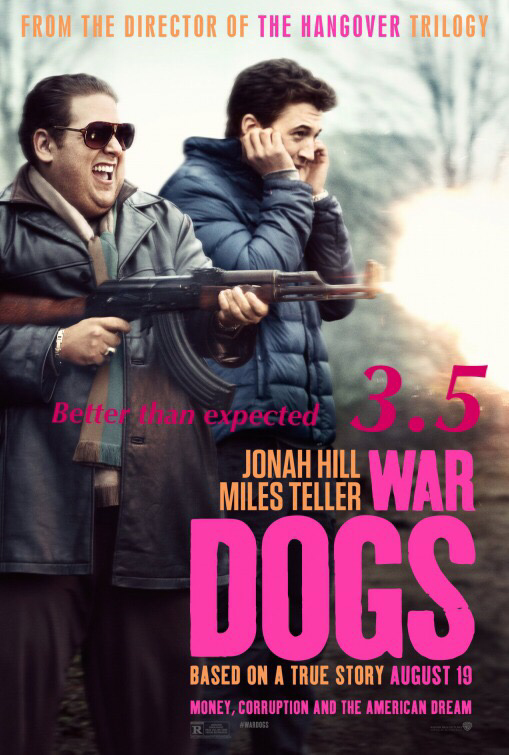 War Dogs is out now!